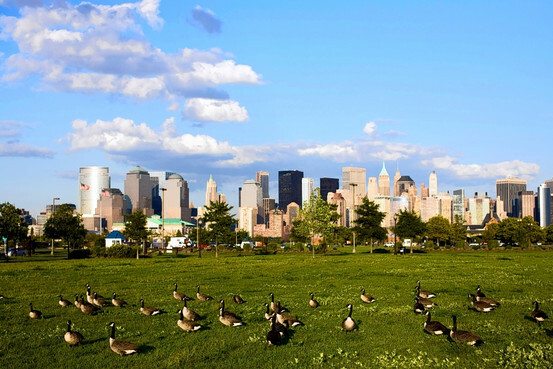 Just across the Hudson River from Manhattan and easily accessible by the PATH train, Jersey City is increasingly a popular destination for those who want to be close to New York City without being immersed in its bustle. Once a heavily industrial area, the area has in the past several years seen a surge in new development and in conversions of former industrial buildings into housing, office, retail and entertainment space. The short commute, the views and the relatively low prices draw some Manhattan workers. Others both live and work in the area, creating a community dedicated to seeing the city thrive. Liberty State Park in Jersey City offers views of the lower Manhattan skyline. Recently built high-rises abound. Some, like Grove Point, a rental building in the downtown area that opened in 2007, found themselves near capacity soon after opening. The Newport area along the waterfront, a mixed-use community with retail, office, entertainment and residential spaces, has several luxury towers, including a 31-story rental building, Aquablu. That building opened last summer and includes 355 apartments. Studios start at $1,800 a month, and three-bedrooms at $3,495. Nearby at the Trump Plaza Residences, a 55-story tower with a 24-hour doorman and full-time concierge, one-bedroom units start at more than $400,000. For those not interested in modern buildings, there are options in former warehouses, factories and even hospitals. The Art Deco Beacon condominium complex, built in the former Jersey City Medical Building, features a fitness center, pool, screening room and children's playroom. An on-site bar and lounge called Prohibition is also in the works. Studios at the Beacon start at $235,000. The residences at Dixon Mills, where studios start at more than $200,000, are in a former pencil factory and feature hardwood floors, oversized windows, and high ceilings. Some units also have exposed brick walls and terraces. More plans for development are in the works. Just this week, the Jersey City Council approved a 244-acre plan to develop the Journal Square area in the city's central business district. Efforts to clean up chromium and other metals left by decades of industrial activity are under way in areas such as Bayfront, Harbor Place and Canal Crossings, in preparation to begin creating mixed-use developments, says Robert Antonicello, executive director of the Jersey City Redevelopment Agency. Many of the plans for new developments are centered around public-transportation hubs, partly to encourage those who commute to New York City to make Jersey City home, he adds. There are also plans to develop the derelict Powerhouse, which once provided railroad electricity and later was used as a storage site for railroad equipment, into a cultural hub with space for performing arts. Of course, the plans remain just plans until executed, so many of the developments have a long way to go. Some Jersey City residents still rely on New York night life for their entertainment and say PATH train service can be unreliable, particularly at night and on weekends. Parks: Liberty State Park has a promenade for walking, jogging and biking, as well as playgrounds and access to fishing, crabbing, boating and kayaking. The park offers not only stunning views of the Manhattan skyline but also ferry service to Ellis Island and the Statue of Liberty. Other green spaces include the 270-acre Lincoln Park, which has recreation fields and wetlands. Smaller green spaces include Lafayette Park, Van Vorst Park and Hamilton Park, among others. Dining: The Grove Street area is the central location for dining, and popular restaurants include Marco & Pepe, which offers brunch, dinner and dessert, and the Merchant, a bar and restaurant housed in an old bank—a vault, now used for storage, is in the main dining room. The diverse ethnic community has contributed a variety of restaurants, including Taqueria Downtown, which offers fresh Mexican food for a low price. Zeppelin Hall Restaurant & Biergarten offers indoor and outdoor seating, and Bar Majestic is in a converted theater. For a sweet treat, try Made with Love Organic Bakery & Café. Craig Donado of Jersey City at the Beechwood Café and Market on Grove Street. Shopping: Kanibal Home is a clothing, accessories and home-décor store that also sells refurbished furniture and vintage dishware. For more accessories and clothing, also try Tia's Place, Another Man's Treasure Vintage Store and Aspasia's Boutique. Stockinette Knitting Café offers coffee and pastries along with knitting materials. Other finds include FJB Comics & Games. Newport Centre, a three-level mall in the Newport Hudson Waterfront Community has department stores like Macy's and Sears, as well as other retailers like American Eagle Outfitters, Brookstone, Fossil and Godiva Chocolatier. Schools: There are 31 schools for students in kindergarten through 8th grade, as well as six high schools. Of the 1,258 high-school students who graduated in 2009, 776 went on to a two-year or four-year college or university, and they received nearly $8 million in scholarship money, according to the Jersey City Public Schools 2008-09 annual report. Private schools include the Our Lady of Victories School, the Our Lady of Mercy Academy and the Al Ghazaly School. Higher-education options include the New Jersey City University, which offers courses in areas like media arts, business, education and criminal justice, and St. Peter's College, a Jesuit college with undergraduate, graduate and professional programs. Deirdre Long/For The Jersey JournalEco-tour guide Sarajane Bruno shows a red beard sponge and explains the species' importance to the Hudson River estuary during a tour of Caven Point Beach in Liberty State Park, Jersey City, last month, which was followed by kayaking in the harbor. Eight eco-tourists hit the beach last month for an eye-opening exploration of natural beauty and a thriving ecosystem. But the beach wasn't in a far-flung, exotic locale; it was in Jersey City. "It's amazing knowing you can step out your door in this hectic city and be surrounded by such serene natural beauty," music producer/songwriter Radcliffe Isaacs of Jersey City said after the tour. "I wish I could've laid back and drifted in the water all day." The tour focused on the area's part in the Hudson River estuary, a complex system of waterways influenced by the tidal waves of the Atlantic Ocean. After rowing to Caven Point Beach -- a winding strip of sandy land -- the eco-tourists stumbled on two message bottles that had washed ashore. In the shadow of the Statue of Liberty, a 16-year-old Gallic time capsule was spotted resting in the gritty gray sand, having apparently floated to Jersey City from France. Stuffed inside were faded French magazine clippings and yellowing strips of white paper with greetings and dated messages about love and life handwritten in French by an anonymous author. The kayaker who spotted the bottle took it home to share with her daughter. Amazingly, a second message bottle was then discovered, nestled among the masses of spent oyster and mussel shells that dot the beach. The clear bottle was sealed tight with a scrolled up message inside. Unable to safely retrieve the message on site, the eco-tour guides took it back to the Interpretive Center. After carefully removing the faded paper, they found a message from a hopeful unnamed author wishing for long life, love and prosperity. "You hear so much about messages in bottles," an astonished Sarajane Bruno, one of the eco-tour guides and an Interpretive Center staff member for eight years, said. "This is surprising to find two in one shot because they are such a rarity." They weren't the first bottles she'd seen, though. A couple of years ago, she said, an Interpretive Center superintendent found a bottle tossed by a jilted lover containing an engagement ring and the message, "I hope you have better luck than I did." Jane Sepulveda, the second eco-tour guide, spotted the imposing helmet-like body of a male horseshoe crab swimming near the shore. More than 250 million years old, this "living fossils" species predates man and has remained unchanged in appearance since prehistoric times. An important part of marine ecology, horseshoe crabs provide an invaluable food source for the many migratory birds that fly through the harbor on their journeys north and south. The State of New Jersey has a strict population management program in place to monitor the breeding and growth of these sea creatures. A deflated Mylar birthday balloon glistened in the sun a few feet away from a rare baby sea turtle. Removing the balloon, Bruno told the group about the choking hazard Mylar and latex balloons pose to these endangered marine animals. Landing in waterways after being released in the air, balloons get ingested by the sea turtles, mistaking them for jelly fish, one of their favorite foods. Mounds of spindly red "fingers" bobbed in and out of the estuary waters. The appendages were actually floating red beard sponges, multi-celled animals that filter microorganisms through minuscule pores and breathe valuable oxygen back into the water. Red beard sponges are one of the few species of sponge that can flourish in the brackish waters of the estuary, the guides said, and are an indication of the Hudson's progressively healthy marine environment. "We had an extremely successful first season on the water," Lori Garth, an Interpretive Center resource interpretive specialist and the kayak eco-tour program coordinator, said. "There was a great demand for the opportunity to learn both how to paddle a kayak and learn about the ecology of the Hudson River estuary." The kayak tours continue through the end of August but are currently full. Call the Interpretive Center at (201) 915-3409 for information about other estuary education programs as well as details on the 2011 Hudson River kayak eco-tour season. Note: Deirdre Long -- an active supporter of marine and environmental restoration, an avid water sports enthusiast and a volunteer with the Hoboken Community Boathouse's kayaking program --has written for Inc Magazine and Nightclub and Bar Magazine and was been a script researcher for a segment of NBC's "Weekend Today New York with Pat Battle." 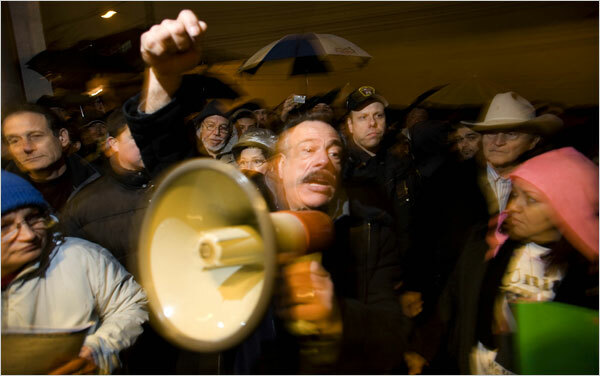 OPPOSED Raymond Morejon, a florist, attending a rally in West New York. He says the tax hike may put him out of business. FIST and voice both raised, Carole Rodriguez, 64, joined hundreds of outraged residents in front of City Hall on a recent Friday afternoon to protest a 27 percent property tax increase. City officials say the tax increase is the only way to plug a more than $15 million budget shortfall in this working-class town of around 46,000 with a nearly $70 million annual budget just across the Hudson River from Manhattan. Robert Corrales, a spokesman for the governor’s office, said that the administration is reviewing the federal stimulus package that President Obama signed, but that it is not yet sure if or how it would affect aid to cities and towns. Chris Hoene, director of policy and research for the National League of Cities, said the stimulus money would go toward specific municipal government programs, like transportation or helping people stay in their homes, which could indirectly “shift the burden” away from property taxes. He added that in New Jersey, as well as several other predominantly northeastern states, the property tax is the primary source of municipal revenue, as opposed to the sales or income tax. “It’s the lack of other options that forces this scenario,” he said. West New York will lay off 100 municipal employees, around a quarter of its work force, including police and fire personnel, officials said. Joseph McConnell, the business administrator for West New York, said the city incurred millions in debt from rolling bills over year after year, like insurance payments. Last year the city plugged part of the hole with $9 million it raised from selling a municipal parking garage to the Hudson County Improvement Authority, Mr. McConnell said, though the town was still forced to raise property taxes by more than 20 percent. This year the city had no other properties to sell, Mr. McConnell said, and the only option was to raise property taxes again. Raymond Morejon, 52, a florist who has run a shop on 61st Street since 1981, said that the tax raises threaten to put him out of business, as he has had to borrow money to pay the increase. He has attended several of the town’s antitax rallies and circulated petitions calling for the mayor to step down. The national recession, which has led to declining home sales and decreased revenues for towns and cities, may not be the biggest player in West New York’s current budget drama. Mayor Silverio A. Vega, known as Sal, blamed the town’s former chief financial officer, Darren Maloney, for the budget shortfall. Mr. Vega said Mr. Maloney kept the municipality’s commissioners in the dark about the town’s mounting debts. Mr. Maloney could not be reached for comment. Many angry city residents don’t believe the mayor’s claim that the budget could have been so far off balance without his knowledge. “He can’t blame one person, he’s the mayor of the town, he’s supposed to oversee everybody,” said Ana Pereira, 41, who owns a restaurant called Ana’s Kitchen and also circulated a petition calling for Mr. Vega to resign. Felix E. Roque, a doctor who said he planned to run against Mr. Vega in the 2011 election and has recently been giving fiery speeches to crowds of hundreds opposing the tax increase, said many residents are now forced to choose between their taxes and their basic necessities. Statewide it is too soon to know how many towns will be hit with a large property tax increase, said Joseph V. Doria Jr., commissioner of the Department of Community Affairs. “Many municipalities are still in the process of introducing their budget,” he said. Along the Hudson River, on what is commonly referred to as New Jersey’s Gold Coast, residents in Hoboken are feeling the sting of a 47 percent property tax hike, enacted because the state sent in a supervisor to manage the city’s finances after the city council failed to pass a budget. “When the budget is adopted for 2009 and 2010 you’re going to see a substantial leveling off of our tax levy,” said David Roberts, the departing mayor. Officials in West New York also said that property taxes should level off next year and in the future increase only from 2 percent to 3 percent annually just to keep pace with inflation. Their words have offered little solace to home and business owners grappling with how to make ends meet after this year’s raise. “This is impossible, I haven’t paid my utilities, I haven’t paid anything,” said Claire Lima, 55, an out-of-work homeowner who said that after the increase, her property taxes jumped to $3,000. The formerly impoverished community has been transformed by billions in development, including the new Westin. Normally the opening of a new hotel isn’t such a big story, but the opening of the Westin Jersey City Newport this week symbolizes the changes that can occur in an impoverished neighborhood when private enterprise and local governments work together. There was a time when Jersey City was symbolic of all that was wrong with New Jersey: dilapidated warehouses, rail yards and high crime were the dominant theme of this small city across the Hudson River from downtown New York City. But 25 years after politicians and local entrepreneurs partnered to revive Jersey City, the town has become a showpiece of success and the new Westin is the town’s newest crown jewel. The newly built property was developed by the LeFrak Organization and is owned by a joint venture of LeFrak Organization and Melvin Simon & Associates. The Westin Jersey City Newport features 429 guest rooms, meeting facilities, upscale dining and all of the Westin brand’s refreshing signature amenities and services. Newport is a master-planned mixed-use community, consisting of retail, residential, office, leisure and entertainment facilities on several hundred acres on Jersey City’s Hudson River waterfront opposite Manhattan’s World Financial Center. Since construction began in June 1986, $2.5 billion has been invested, and more than 16 million square feet has been developed. Completed is the community’s infrastructure, including roads, bridges, and utilities: sewers, storm drains, water supply, gas, telephone, electric systems, and an electric power substation. 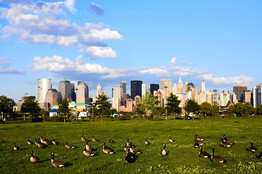 There are nine high-rise rental apartment buildings: 3,476 units (100% rented); 885 condominium units (all sold); a 1.2-million square foot regional shopping mall; eight office buildings; restaurants, parks and playgrounds; preschool facilities; a private elementary school; a mile and a half segment of the Hudson River Waterfront Walkway; a marina; and on-site parking for more than 147,000 vehicles. Newport's Office Center incorporates leading-edge technology in eight state-of-the-art commercial towers. The first office building was the 472,093 square foot, 14-story Newport Financial Center, located at 111 Town Square Place. As one of the top ten telecom buildings in the country, it provides tenants with five separate fiber entrances; 10 carrier switches, 40,000 square feet of collocation space and fully provisioned floors. It is leased to business firms and financial institutions seeking “high-tech” facilities within the New York Metropolitan region. According to U.S. Senator Robert Menendez, the city has gained such traction in the financial community that there are more NASDAQ trades done in Jersey City than in New York City. “I have lived in the area all my life. This was a place that was a legacy of past failures. We needed a vision and the LeFraks came along and said this was a great opportunity,” said Menendez. The town’s major financial clients include UBS, JP Morgan Chase, Bank of America, Morgan Stanley, Charles Schwab, HSBC and ISO. “Great moments are born from great opposition. We are facing a headwind, but there is promise and opportunity with this hotel. We look to deliver personal, distinctive service to our guests and to each other,” said Michael E. McLaughlin, general manager of The Westin Jersey City Newport. Sue Brush, Senior Vice President of Westin Hotels & Resorts, said this hotel compliments Starwood Hotels & Resorts’ other Garden State hotels. “Westin has opened 58 hotels in the last three years. We will open 14 this year and are on track for 200 hotels by 2010. The bottom line goal is to establish an emotional connection with the guest so they’ll come back. Guests of Westin purchased nearly $20 million in retail products from us last year. When they do that they come back,” she said. The hotel features 20,500 square feet of meeting space, including 30 meeting rooms. The Newport Grand Ballroom offers more than 10,000 square feet of space and 20-foot ceilings and can easily accommodate 1,450 guests for a reception or 790 for a seated dinner. The hotel will also provide an experienced team of culinary specialists, meeting planners and a seasoned wedding planner. Already the hotel has 17 weddings booked for the coming year. A COUPLE of years ago, when the market for condominiums on the western bank of the Hudson River was smoking hot, some real estate brokers felt as if they were being burned by upstart developers. PANORAMIC VIEWS Kaja Bolton, an agent at Liberty Realty, was one of the first buyers to close on a condo at Harborside Lofts in Hoboken. But other developers — including two of the most prominent on New Jersey’s “Gold Coast,” Toll Brothers City Living and Metro Homes — cultivated sales agents, even if they didn’t have to then, because they knew it would eventually be to their benefit. Quite a few brokers, often avid real estate investors themselves, wound up putting their money where their mouths are, at Toll City properties. Some 40 of them have bought $35 million worth of real estate at Toll buildings that have gone up on the Hudson waterfront over the last three years, according to Toll’s records. Real estate sales agents have bought condos to live in, or to rent to tenants — or both — at four company properties, including 700 Grove in Jersey City, and Harborside Lofts at Hudson Tea, and Maxwell Place on the Hudson in Hoboken, Mr. Jogodnik said. Many of those same people have also brokered sales and are continuing to market condos in buildings where they own property, he added. Dean Geibel, the principal of Metro Homes, said he had witnessed the same broker “hat trick,” so to speak, at several of the buildings his company has developed in the waterfront district. Arlene Wittig, an agent at Re/Max Competitive Edge, signed a contract two years ago for a 600-square-foot studio at Gulls Cove, a Metro Homes complex in Jersey City, intending to “flip” the property. (The site — beside a light rail station and a ferry stop, and four blocks from a PATH train — seemed “ideal for turning a profit,” she said.) Then, last year when the market began sliding in the suburbs of Somerset County, where Ms. Wittig owned a 2,300-square-foot town house, she decided to sell the house and move into her studio instead. “I love it,” said Ms. Wittig, 53, who now commutes to her office in Somerset County. 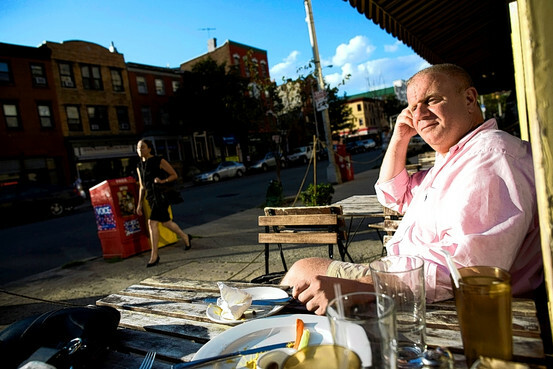 “I can walk to fine dining, shopping, take the light rail to Hoboken, or wherever. It’s like being inManhattan, without the added expense. “That’s what I tell my customers,” she said, “and that’s what I believe.” She said she had sold four other units at Gulls Cove since moving in. David Najjar, who owns his own agency, Realty Executives, is another buyer/seller at Gulls Cove, which offers units ranging in price from the low $200,000s to more than $1 million. Mr. Najjar, 31, and his partner live in a two-bedroom corner unit with a view that takes in the Midtown Manhattan skyline as well as the Statue of Liberty. By contrast, Kaja Bolton, an agent at Liberty Realty, bought at the top end of the market, in March 2008, becoming the first resident to close at Harborside Lofts, a 116-unit building. In addition to a 1,950-square-foot penthouse with two bedrooms and a den, she and her fiancé, Steven Broomhead, paid $200,000 for one of several private rooftop terraces with full-panorama views. Originally from Norway, Ms. Bolton says she finds Hoboken a sort of European oasis in New Jersey: a small, densely populated and walkable city. She thinks that the opening of the W Hotel this spring will bring more excitement, and that the mile-square city will weather the prevailing economic and real estate troubles quite well. Ms. Visaggio, the Coldwell Banker agent, says she has sold units at each of the Toll buildings, as well as several of the Metro Homes buildings. She says she owns another Hoboken condo that has lost about $100,000 in value since the recession hit. 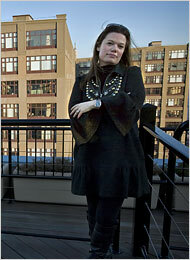 Rental rates, however, have stayed strong, she said, so the investment is not a losing proposition as of yet. David Paris, a Century 21 agent in Hoboken, has just invested in a two-bedroom condo in Jersey City that he plans to rent out. Mr. Paris, 38, recently decamped from Hoboken, moving with his wife and two young children to a single-family house in Morris County. As an investment, he bought a 1,200-square-foot apartment at Matzel & Mumford’s Crescent Court, a 54-unit midrise building with enclosed parking that is under construction. Mr. Paris bought in the mid-$400,000s, with a 5 percent down payment, and estimates that the unit will rent for about $2,500 a month. NEW YORK (Reuters) - NJ Transit is expecting the U.S. government to complete environmental reviews for its planned Hudson River passenger train tunnel in the near term, which would clear the final hurdle to allow it apply for needed funding. The NJ Transit system and the New York-New Jersey Port Authority are seeking $3 billion in federal funding for the $8.7 billion project, Paul Wyckoff, a NJ Transit spokesman, said late Thursday. The new tunnel is expected to be operational in 2017. It would bring 25 trains an hour from New Jersey into Pennsylvania Station in midtown Manhattan. The new system will ease the pressure on the existing tunnel, which can handle only 23 trains an hour, Wyckoff said. A sharp rise in demand for the service has led to frequent delays. A Federal Transit Administration spokesman said it was working "to advance the project into the final design stage." The environmental review is an interim step that will detail the agreement between the federal agency and the project sponsors. President-elect Barack Obama has highlighted upgrades of the nation's roads, bridges and transit systems in his economic revival plan, and states and cities around the nation are all eager to have their projects "shovel-ready." The federal government on Tuesday approved a $5.2 billion proposal for a commuter rail from Washington D.C. to Dulles International Airport, clearing the way for a 60-day congressional comment period on $900 million in rail construction grants to states in the region. Once the project has been completed, work will begin to provide public transportation from the nation's capital to its major airport, said a spokesman for Virginia's Democratic Gov. Tim Kaine. "You'll start seeing some dirt being moved and construction will start pretty quickly," spokesman Gordon Hickey told Reuters. Some work has already begun with the $160 million allocated by his state, he said.